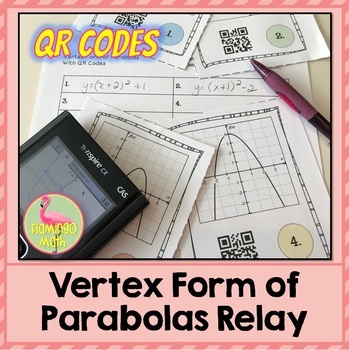 VERTEX FORM OF PARABOLAS RELAY with QR CODES is an activity which will help your Algebra students practice writing equations in vertex form, from graphs of parabolas. The activity is designed as a relay for teams of 5 to 6 each. Students are given a parabola and must write the equation for the graph in vertex form. The relay includes 12 cards and is in the form of a Quiz-Quiz-Trade Kagan® strategy. When pairs are finished, they can check their results with a QR Reader APP on their cell phone. A set of cards without QR Codes is also included. 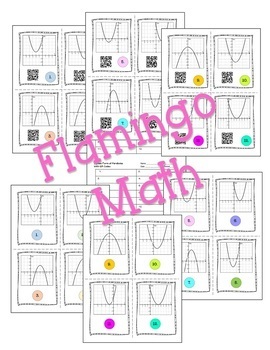 An answer key and student recording sheet are provided. Be the first to hear about my new products, sales, and FREEBIES! Click on the green star near the top of any page in my store to become a follower. This will allow you to receive customized e-mail updates about my store.